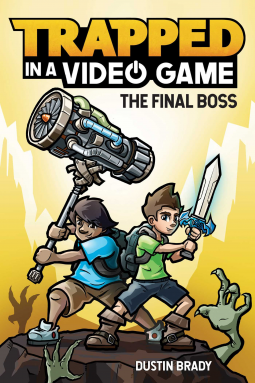 This is the final book in the "Trapped in a Video Game" series, and possibly my favorite. The first four books took our two heroes into various games, (I liked the retro side scroller from Book Four's Doom Island), as they tried to figure out the mystery they were caught in. But this Book Five brings it all together, allows them to confront the Final Boss, and is a fine example of middle grade LitRPG. I think of LitRPG as consisting of a hero following a traditional path that you'd find in an RPG, (say, "save the Princess"), but aware of the fact that he is actually in a Role Playing Game, either voluntarily or by unhappy chance. So, you get to see how well the author can mix and match the conventions of romantic adventure novels with the conventions of role playing games. Some tip more to one side and some tip more to the other. This one leans heavily to the RPG side and spends lots more time on the game-ish parts than the actual adventure plot, which is almost an afterthought. Surprisingly, the two heroes have become more engaging and interesting as the series has progressed. Sometimes in a series like this a lot of effort is put into the first book to establish the characters, and then they just stay put. Here, our narrator and his partner have gotten funnier and more insightful as the story has developed, and they are better characters now than when we started out, which is a nice treat and helps keep interest and engagement up. My bottom line is that I enjoyed this series and would expect a middle grade reader who enjoyed either adventure or computer gaming to be interested in giving the books a try. A fun find.